Everton took a step closer to fulfilling Roberto Martinez's pre-season promise of Champions League football as they swept past Arsenal to move a point behind the fourth-placed Gunners. Martinez's team produced a devastating display of attacking force, Steven Naismith opening the scoring by tucking in a 14th-minute opener after Romelu Lukaku's shot was saved. 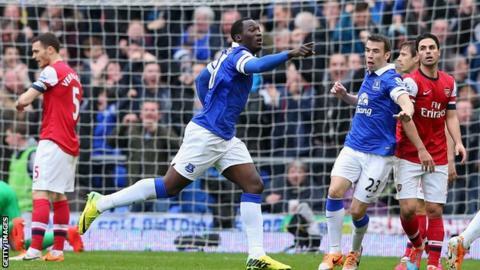 Belgium striker Lukaku then fired in his 14th goal of an impressive season after another fine sweeping move, and compatriot Kevin Mirallas forced Mikel Arteta into an own goal after the hour mark to complete the scoring. Everton's front four, which included early substitute Ross Barkley, purred throughout and at times reduced Arsenal's defenders to a squabbling mess. It was another humiliating day on Merseyside for the Gunners after their 5-1 drubbing at Liverpool in February. With Everton having played one game fewer than Arsene Wenger's side, a place in Europe's elite competition for the first time since 2005 is now in their own hands. The Toffees still have to face Manchester City and Manchester United at home, but the manner in which they beat Arsenal for the first time since 2007 will give supporters the belief that Martinez can deliver on the pledge he made to owner Bill Kenwright at the start of the season. Substitute Alex Oxlade-Chamberlain hit the bar late on for the Gunners but where Arsenal's attacks dithered, Everton's forwards were powerful and precise, a reflection of the positive mentality Martinez has instilled in his first season in charge. The hosts were assisted by an enforced early substitution when Barkley came on to replace the injured Leon Osman, who suffered concussion and needed five stitches in his face after a foul on Bacary Sagna for which the Everton man was booked. England international Barkley slotted into the number 10 position, as Lukaku moved to the right. And the switch shaped a first half in which Everton laid the foundations for their sixth successive victory. Full-back Leighton Baines had already found Naismith in space once before the opener, and when he picked out Lukaku soon after, Wojciech Szczesny's save was to no avail as the onrushing Naismith converted from the rebound. The Scotland international - promoted to the starting XI after coming on to score in Everton's 3-1 win at Fulham last weekend - moved into a more advanced role after Barkley's introduction, as the hosts continued to bear down on Arsenal's goal. The visitors were limited to a trio of efforts from Lukas Podolski in the first half and their keeper Szczesny found himself far busier than Everton counterpart Tim Howard - the Pole had already made two fine stops from Mirallas and Barkley before the hosts extended their lead. The ball was swept out to Lukaku on the right and he steamrollered his way towards the Arsenal penalty area before unleashing an unstoppable shot into the far corner. The visitors belatedly applied some pressure of their own early in the second half as Nacho Monreal fired across goal, while Aaron Ramsey looked bright on his first appearance since Boxing Day. But with little serious sign of a comeback, Everton sealed the win with a goal for which Mirallas deserved the credit. The Belgian dispossessed Sagna, raced forward and, after Naismith was thwarted by Szczesny, followed up to pressure Arteta into an own goal, completing a miserable day for the Spaniard against his former team. With an easier-looking run-in than their hosts, Arsenal boss Wenger will hope his side can recover from this latest setback - and that Everton do not show form as impressive as this against the likes of title contenders Manchester City. For a photo gallery from Sunday's Premier League action, visit the BBC Sport Facebook page. Match ends, Everton 3, Arsenal 0. Second Half ends, Everton 3, Arsenal 0. Offside, Arsenal. Bacary Sagna tries a through ball, but Yaya Sanogo is caught offside. Mikel Arteta (Arsenal) is shown the yellow card. Corner, Arsenal. Conceded by Gareth Barry. Corner, Arsenal. Conceded by John Stones. Attempt blocked. Alex Oxlade-Chamberlain (Arsenal) right footed shot from the left side of the box is blocked. Assisted by Santiago Cazorla. Substitution, Everton. Gerard Deulofeu replaces Romelu Lukaku. Corner, Arsenal. Conceded by Leighton Baines. Attempt saved. Alex Oxlade-Chamberlain (Arsenal) right footed shot from outside the box is saved in the top right corner. Assisted by Aaron Ramsey. Attempt blocked. Aiden McGeady (Everton) right footed shot from outside the box is blocked. Assisted by Kevin Mirallas. Substitution, Everton. Aiden McGeady replaces Steven Naismith. Offside, Arsenal. Aaron Ramsey tries a through ball, but Yaya Sanogo is caught offside. Offside, Everton. Sylvain Distin tries a through ball, but John Stones is caught offside. Substitution, Arsenal. Yaya Sanogo replaces Olivier Giroud. Corner, Everton. Conceded by Thomas Vermaelen. Attempt saved. Santiago Cazorla (Arsenal) left footed shot from the left side of the box is saved in the bottom left corner. Assisted by Tomas Rosicky. Substitution, Arsenal. Alex Oxlade-Chamberlain replaces Lukas Podolski. Substitution, Arsenal. Aaron Ramsey replaces Mathieu Flamini. Attempt saved. Ross Barkley (Everton) right footed shot from the right side of the box is saved in the centre of the goal. Assisted by Romelu Lukaku with a through ball. Own Goal by Mikel Arteta, Arsenal. Everton 3, Arsenal 0. Foul by Tomas Rosicky (Arsenal). John Stones (Everton) wins a free kick in the defensive half. Santiago Cazorla (Arsenal) wins a free kick in the attacking half. Attempt blocked. Romelu Lukaku (Everton) left footed shot from outside the box is blocked. Assisted by Gareth Barry. Attempt missed. Mathieu Flamini (Arsenal) right footed shot from the centre of the box misses to the right. Assisted by Santiago Cazorla. Foul by Bacary Sagna (Arsenal). Attempt saved. Olivier Giroud (Arsenal) left footed shot from the centre of the box is saved in the centre of the goal. Second Half begins Everton 2, Arsenal 0. First Half ends, Everton 2, Arsenal 0. Mathieu Flamini (Arsenal) is shown the yellow card for a bad foul. Foul by Mathieu Flamini (Arsenal). Steven Naismith (Everton) wins a free kick in the defensive half. Attempt blocked. Tomas Rosicky (Arsenal) right footed shot from outside the box is blocked. Assisted by Nacho Monreal. Corner, Arsenal. Conceded by Tim Howard. Attempt saved. Lukas Podolski (Arsenal) left footed shot from the left side of the box is saved in the top left corner. Assisted by Olivier Giroud. Attempt missed. Romelu Lukaku (Everton) left footed shot from outside the box is close, but misses to the left. Assisted by Seamus Coleman.